DOS King's Quest: Quest for the Crown (2.0F) in 00:18.3 by DrD2k9. 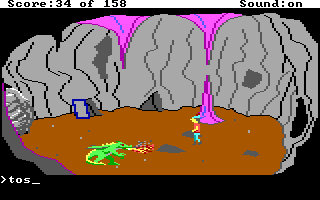 King's Quest: Quest for the Crown is a game first released by Sierra On-Line in 1984, then re-released in 1987. In it, Sir Graham has to retrieve three magical items from the realm, so that he can be crowned King of Daventry after the current king dies. DrD2k9 becomes the next king in record time. Due to the sheer speed of the movie, the second set of downloadables play back the movie at 1/5th of the regular speed.